In approximately 2009 the Kumbo Water Authority asked for help from Canadians. The project focus has been on improving the water collection, treatment and delivery system. Some very important aspects of the project also were the community work that was done to help citizens understand the importance of using clean water, and how to keep it clean. This expanded into teaching about organic farming practices, and other practices that are vital for keeping the water source clean. I was so fortunate to be able to play a small part in this project, when I went to Kumbo Cameroon in June of 2010 to teach business skills to the management staff of the Water Authority. I'm very grateful to my friends Donna and Rich for this opportunity. While I was there, I was inspired to write the song Kumbo Water Song and write the book, Clean Water for Lukong. 200 copies of the book are in use in Kumbo. Copies are also in Ghana, Ivory Coast, and in December, 2011, 30 copies went to Kenya. They are a hit! 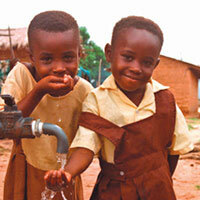 Clean Water for Lukon serves to tell the story of water, and as a literacy aid. There are very few books in Africa which are so colourful, and contextually appropriate. Kids at a rehabilitated water tap in Kumbo. Photo appears on the back of the book. How can you contribute? Close to 300 books have been sent to communities in Africa. The kids love it! 3 schools in Kumbo used the book as the basis for a play at the school year end last June. Your donation of $10 or more will purchase books (@ $10/each) for Africa. The books are delivered by hand through community development organizations/projects, and distributed to libraries, schools, and community leaders, along with the Community Leader Guide. Thank you for your donation! 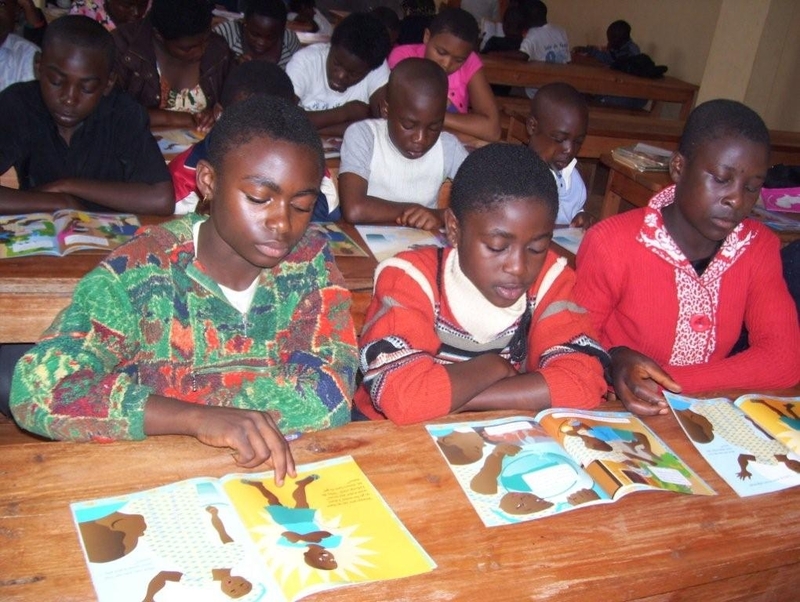 Students in Kumbo, reading Clean Water for Lukong. Great for kids here too! Add Clean Water for Lukong to your child's library. The book is a great read for kids here too - it's fun to know about another culture, and kids here have been very receptive to the book. Profit from sales go to water and literacy projects in Africa.